There’s lots of different designs to choose from to give your pages that special touch and there are so many different ways to scrap with them. 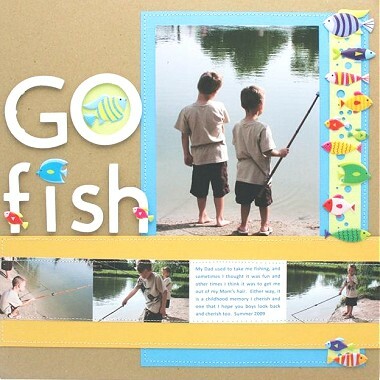 This layout uses Puffy Fish stickers to create a unique border down the ride side of the page. The artist has used a simple strip of green cardstock as the base for her border, punched holes in it to create a bubble effect and strategically placed fish stickers all the way down for a completely unique look. She’s also very cleverly incorporated several fish stickers into her title, again creating a one-of-a-kind embellishment for her page. Of course, you don’t have to use only fish stickers to re-create this effect. Any small stickers will do. 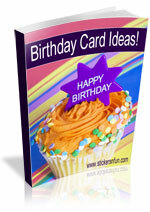 Just choose the theme you want to work with and have some fun. This entry was posted on Monday, March 14th, 2011 at 11:30 pm	and is filed under Beach, Outdoors, Scrapbooking Stickers. You can follow any responses to this entry through the RSS 2.0 feed. You can leave a response, or trackback from your own site.